NHS Employers has taken our involvement in last year's GCC as an example for other Trust's to follow, publishing a case study that showcases the team effort that saw us become the 4th highest GCC performing health organisation worldwide. It shows how, as part of the combined efforts of those taking part, you lost 1,000kg in weight over the 100 days and achieved an average step rate of over 14,500 as well as making positive lifestyle changes and forming long term healthy habits. Th case study details the steps taken to deliver the initiative, the resources needed, key challenges and top tips for other trusts looking to take on the Global Corporate Challenge. ​Anne Westman is another of our fabulous GCC participants and has shared one of her recent achievements that GCC gave her and her husband the incentive to finally do. 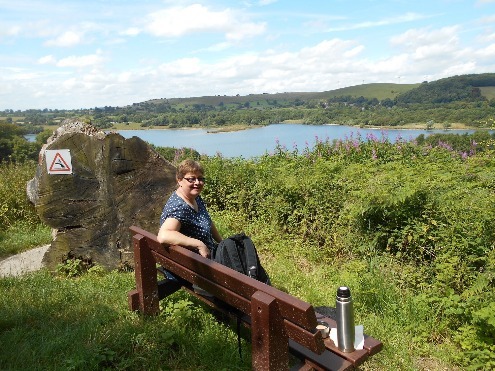 On a sunny Sunday in July Anne and her husband decided to explore the circular walk around Carsington Water; taking none of the shortcuts and having the opportunity to explore Carsington village itself. Anne said that she had a ‘great sense of achievement’ when she had completed the walk and managed to clock up a fantastic 28,000 steps that day! Despite a very sleepy dog at the end of the walk (he is noticeably absent from the photograph, taking a well-deserved nap on the grass!) Anne and her husband had a lovely day together, completing something they had always wanted to do. Anne admits she is enjoying the challenge of GCC and walks that once seemed long now seem short and even hubby is getting out more too! ​Huge well done to Anne on her GCC journey so far. Profile - Beating Your Best! Hi Alice, what’s your team name? I’m in ‘The Alpha Feet Pro-team’, it’s a play on words for one of the things we test for in Pathology which is the Alpha-fetoprotein and fits in well with what the GCC is all about. Pathology is a big department, is there much competition between you? A lot of us did it last year, we had five or six teams across the whole lab and we all wanted to do it again this year. We’ve swapped a lot of the team members around so we’re with different colleagues. There are a few of us who do their own thing and that’s perfectly fine but some of us do get into some friendly competition and try to beat each other’s steps. There’s some friendly banter between us and that just gives the whole challenge a little bit of an edge which is fun. How active have you been this year? Well, last year I averaged around 15,000 steps but probably averaging around 13,500 this year. I set myself a challenge each day to try and get above 10,000 which I normally manage to do. ​Tell us about your personal best. My previous personal best was just short of 21,000 and I heard about the challenge to beat your best. I went out for a bike ride just after midnight, I went swimming, did another bike ride later in the day and went on a few walks before having a good sit down in front of the TV. In the end I managed 42,462 but could have done more if I’d not rested so much. It certainly wasn’t a normal day! For me it was all about getting that virtual trophy and a special pedometer! ​How did you feel the next day? Fine! I came to work as usual, did another aquacise session and some more walking. I would say I normally do 10,000 steps in an average day but the day after my personal best I probably did another 17,000. I think you definitely, even if it’s subconsciously, try to beat your previous day’s total and think much harder about how you can increase your steps. Do you do any activities with the rest of your team? Not really, it’s not always that easy for a group of seven of you to get together. Some of us have got children, we may work at different times or have other plans. I’d like to do more at the weekend but sometimes you just need to relax and it’s important to recharge your batteries. I do enjoy swimming but even this can be difficult due to the lane times not necessarily fitting in around work but at least it gets you thinking about other types of exercise that you can be doing. You definitely get a buzz from those big days. ​Do you have any events or special activities planned for the rest of the challenge? 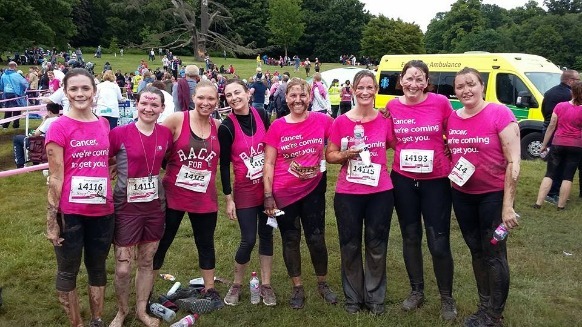 Not yet although some of us did do the Pretty Muddy Race in June at Clumber park which was great fun. We did it last year in support of the wife of one of my colleagues and this year raised around £500 for cancer research. We were debating about how to do it without losing, breaking or damaging our Pulse Monitors and some of us came up with some novel ways of keeping them safe! I think I managed around 8,000 steps around the course. 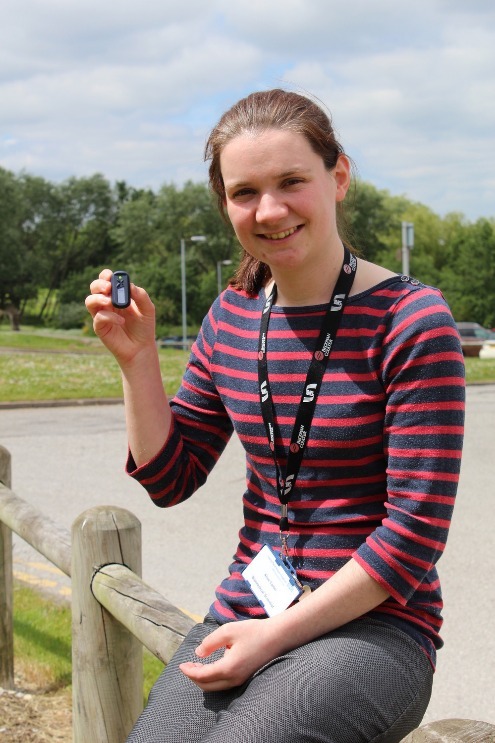 ​Congratulations to Alice who won a special Pulse Monitor to keep. If you have a story you would like to share about your Global Corporate Challenge exploits, whether it’s how you achieved your personal best, an event you’re in training for, a particularly novel way of improving that step count or simply your reason for participating in the challenge then let us know. E-Mail Emily.woodward@nhs.net or call Emily on extn: 6332.